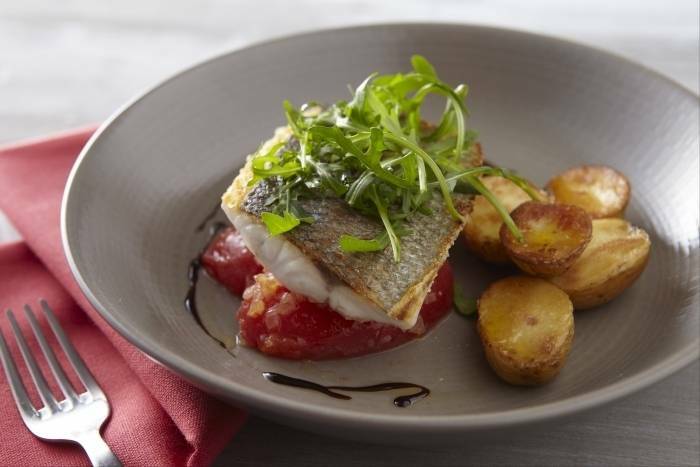 Pan-fried fillet of sea bass served with a tomatoes, shallot and basil sauce and a crushed new potato salad. Cook the potatoes in salted water. Bring to the boil and then simmer until tender. Wash and pick the rocket leaves. Peel the tomatoes, cut into quarters and scoop out the seeds. Finely chop the shallots and the garlic. Pick and chop the basil leaves and the parsley. Finely slice the spring onions. Fillet the sea bass if necessary and remove the pin bones. Heat a pan with a dash of olive oil and sweat the shallots with a pinch of salt. Add the tomatoes and the garlic and cook on a medium heat for 2 to 3 minutes. Add the basil and set aside. Season the fish and add some vegetable oil to another very hot pan and cook the fish skin side down for 2 minutes until golden brown. Transfer to the oven and cook for a further 2 minutes. Remove from the oven and squeeze on some lemon juice. Crush the cooked potatoes with a fork and add the parsley and spring onions. Season with salt and pepper and add 50ml of olive oil. Scatter some rocket leaves on the plate and use a stainless steel serving ring to serve the crushed potatoes, top with half of the tomatoes. Remove the ring and place the sea bass on top. Finish the plate with the remaining tomatoes and a drizzle of olive oil.